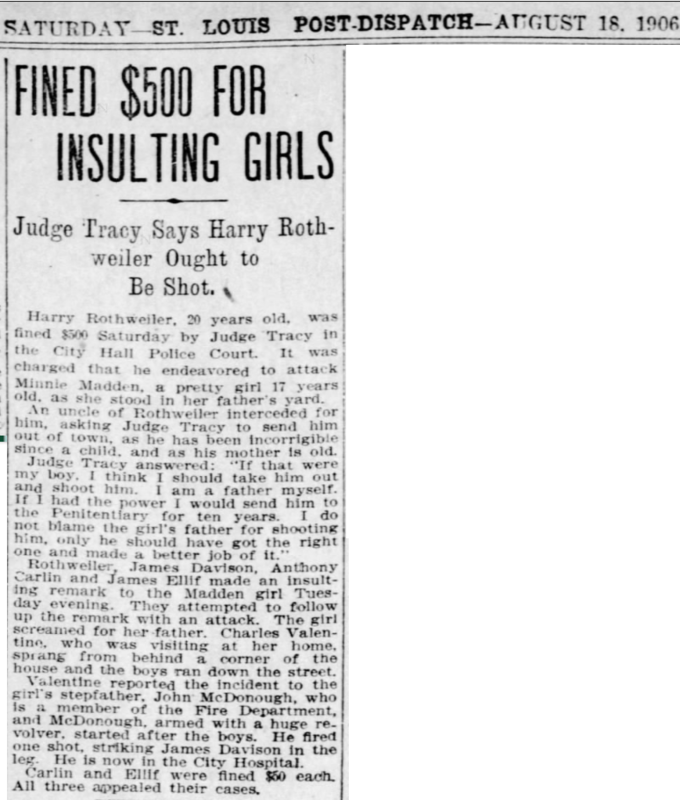 He was fined $500 in 1906, but the St. Louis judge said he should have been shot. There were shots fired, but not by any of individuals involved in the incident. The 18 August 1906 issue of the St. Louis Post-Dispatch provides little detail on the actual incident, only stating that Harry Rothweiler, James Davison, Anthony Carlin, and James Ellif “made an insulting remark to the Madden girl Tuesday evening [and that t]hey attempt to follow up the remark with an attack.” Seventeen-year old Minnie Madden then screamed for her father, Charles Valentine, who chased the boys down the street[ [see our followup–Valentine was not her father]. Valentine told, John McDonough, Minnie’s step-father, and he started off after the boys with a “huge revolver” and fired off one shot. That shot struck James Davison in the leg. McDonough was a member of the St. Louis fire department. The article suggested that Minnie Madden did not live with her father, Charles Valentine, and that he was visiting the residence. Given that Madden’s step-father was in the vicinity, it is possible that Madden resided with him since the incident happened in her “father’s yard.” The newspaper may simply have failed to make the distinction between father and step-father as it did later in the article. Like many newspaper accounts of incidents, it leaves the reader wondering about the details that are not included. Those omitted details include information about twenty-year-old Harry Rothweiler. According to his unnamed uncle, Rothweiler’s mother was “old” and he suggests that her age is part of why Harry was incorrigible. Given that Rothweiler’s father is not mentioned and that it appears his mother is his sole parental influence, it would be reasonable to speculate that Harry’s father is out of the picture in 1906. What the uncle calls “old” is another matter entirely. Not so sure I can agree, sorry. I did not see any relationship between Valentine and the girl. It said girl screamed for father, and Valentine who was visiting responded. Valentine could have been a family friend, or anyone else who heard a scream and rendered aid, just because she screamed “Daddy” doesn’t identify who heard and responded. With all three, Valentine, step dad, and girl having different last names more research would be needed to determine any relationship between Valentine and the girl. Now that I look at it again I realize that it was a period after the word “father.” You’re right. I’ll post an update.